Over the years, watching horror films together also became a way of bonding with my mother. It became our precious ‘us-time’. The binge-watching also made us ‘horror-proof’, no ghost could scare us because we’d seen ’em all in one film or the other. However, we weren’t prepared for the ghosts that resided outside our television screens. Horror is not always about a paranormal experience. Horror can be mundanity of a routine, the unbearable loneliness of modern life or the sheer inability to comprehend it. Following her retirement, the ghost that truly haunts my mother is not the one that oozes blood, but the one that oozes nothingness — loneliness. What exactly is modern family? And what role do individuals play in it? I found myself seeking answers to these questions in a rather unlikely platform — a horror show on Netflix called The Haunting of Hill House. An adaptation of Shirley Jackson’s 1959 novel, the show gives the novel a smart update, elevating it from being another loyal retelling to a comment on the modern family itself. The premise is simple: in the ’60s, Olivia and Hugh Crain spend a summer with their five children at a mansion called Hill House. They want to repair and renovate it so that it can be deemed suitable for sale. However, certain delays ensure that the family continues to stay in the house even as its ghosts prey on their minds. They escape, but not before Olivia dies. The memory of the paranormal occurrences along with their inability to make sense of what really led to their mother’s death shapes the lives of all five Crain children. Paranormal presence aside, it is another kind of horror that makes the show as interesting as it is intriguing — the horror of relationships. Is the modern family also a model family? Or is the idea of ‘model’ itself flawed? All five Crain children — Steve, Shirley, Theo, Luke and Nell — are fighting demons from childhood, and yet a shared trauma that should have brought them closer has only led them on to a different path. Steve has authored a bestseller cashing in on his family’s deeply personal and terrifying experiences at the Hill House. Luke has turned to substance as a way of running away from the ghosts of past — a refuge that proves too costly to his siblings. Theo has grown to be cold, distant and fearful of emotional intimacy. Shirley sees her marriage as being transactional. Nell continues to be haunted by her memories of Hill House and suffers seizures. As adults, they’re also cold witnesses to each other’s lives… as we are so often to experiences of those who’re dear to us. Affording empathy becomes a lot more difficult when it demands a slice of our daily lives. The show is brutal in its portrayal of individualism. Nell, who is in some sort of a mental hell following her husband’s demise, calls each of her siblings in a bid to be understood. However, she is largely unheard. The inability to empathise stems from a state of emotional dysfunctionality. One of the most interesting observations of the show is that the choice is ultimately between being lonely alone or being lonely with someone else. Hugh, who lost his wife many years ago, has kept her alive in his head (he often imagines her telling him what to do and say). This is a way of coming to terms with his loneliness, even if it means forgetting that she tried to kill two of their children. The 60s’ ideal is pitted against the largely dysfunctional marriages of both Steve and Shirley, where the demand for individualism outweighs the need for emotional nurturing. Which marriage would you possibly consider a model marriage? One that compels you to forget certain truths or one where the selfhood remains uncompromised? 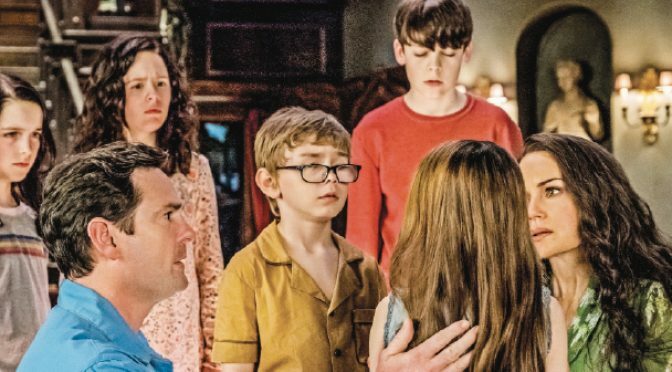 In a review of the show for The Guardian, Arielle Bernstein notes, that in The Haunting of Hill House, “devotion to family is a tender kind of madness that exists just on the other side of mourning, a ghostly insistence that the love that binds us is also the thing that keeps us chained.” Perhaps that is also the truth of the modern family!